Archive for category: Identity Crisis! You are here: Home / Mushroom Diary Blog / Identity Crisis! 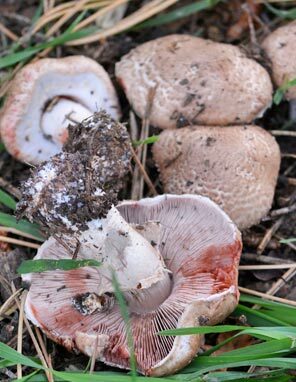 Initially troublesome mushrooms, toadstools or fungus that are hard to identify or that resemble another species. 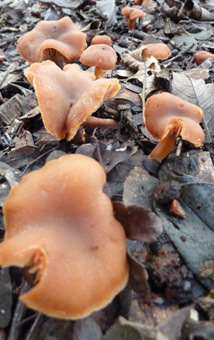 https://i1.wp.com/www.mushroomdiary.co.uk/wp-content/uploads/2013/02/space-blob1.jpg?fit=667%2C298&ssl=1 298 667 J C Harris https://www.mushroomdiary.co.uk/wp-content/uploads/2015/10/mushroomdiary-logo-2015-small.png J C Harris2013-02-20 21:02:102017-11-06 12:30:53Star Jelly? There is quite a few of these babies popping up around now. 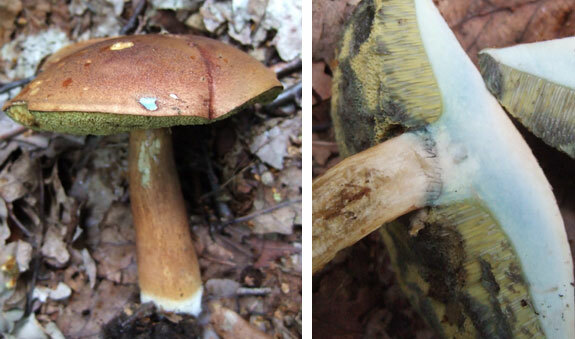 It can be a confusing species to identify because of the similarities with the Panther Cap and Grey Spotted Amanita. 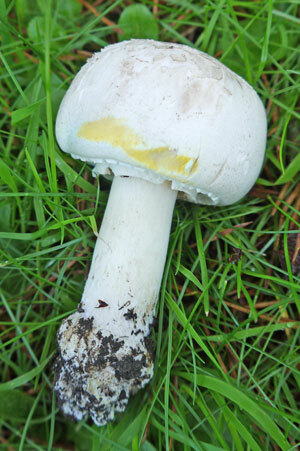 The Blusher (Amanita rubescens) is one of the more common Amanita mushrooms. 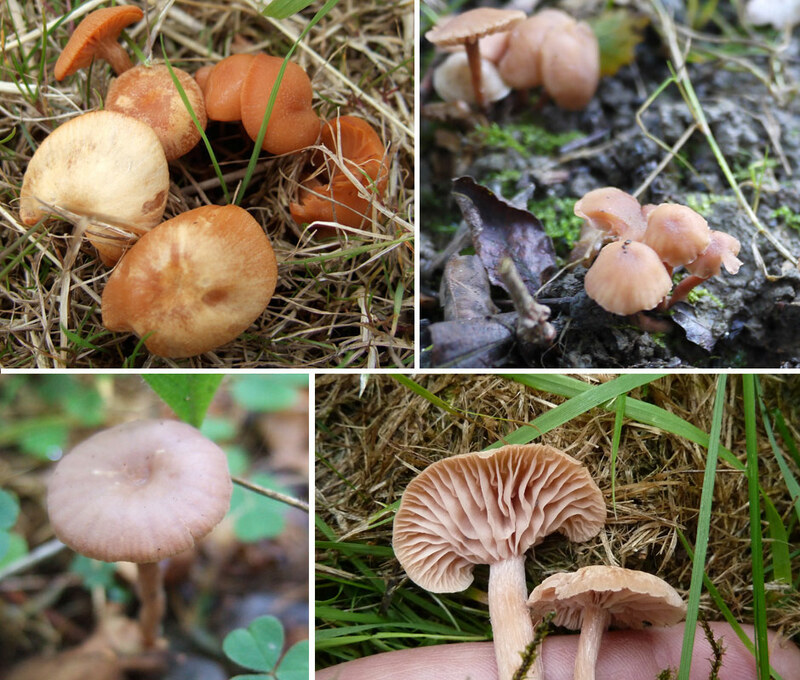 Summer to autumn is the best time to find them, usually solitary, in coniferous and deciduous woodland. 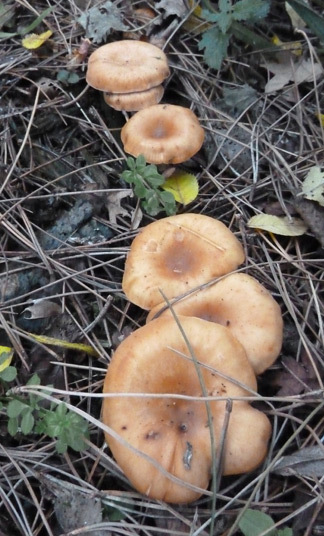 It was hard to choose a category to place it in my blog, because it is a poisonous mushroom but very edible once properly cooked (with cooking water discarded). So if you intend to eat it, making sure you have the right Amanita is naturally top priority. Same goes for any other mushroom you want to consume really. Blushers have a varied cap colour range. 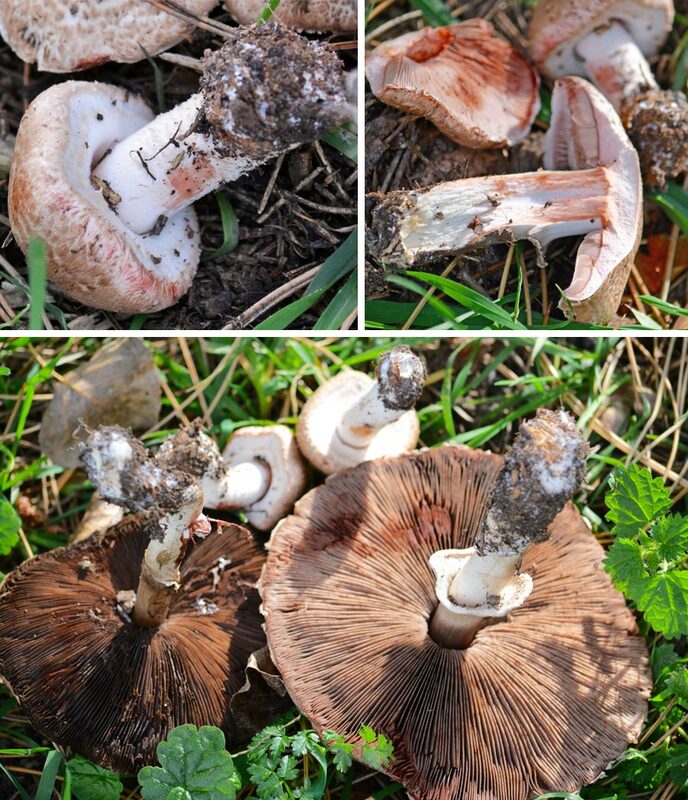 They are often reddish-brown with red tinted or dull grey/white spots (veil remnants), or can be paler with flesh/pinkish tones. Fortunately I have two examples in this post to show in pictures. The paler one was found in Leicestershire and the darker red-brown example was found much further north in Scotland. I don’t know if geographical location bears any relation in this difference. Interesting though. 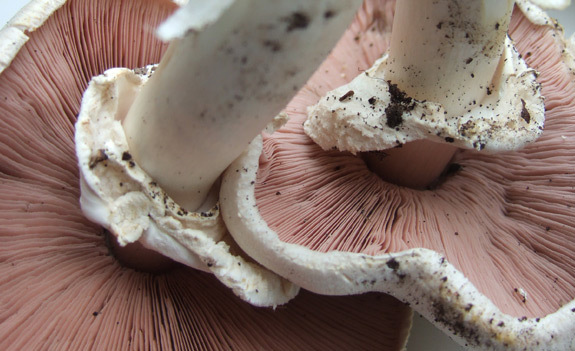 The Blusher gets it’s common name from the way damaged or insect nibbled parts of the mushroom (including the gills) turn pink or reddish-pink. 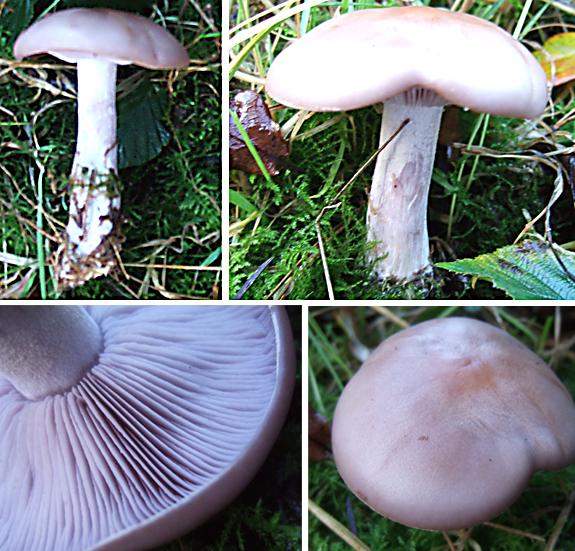 If you handle the mushroom you will notice these changes as the ‘blushing colour’ slowly appears. 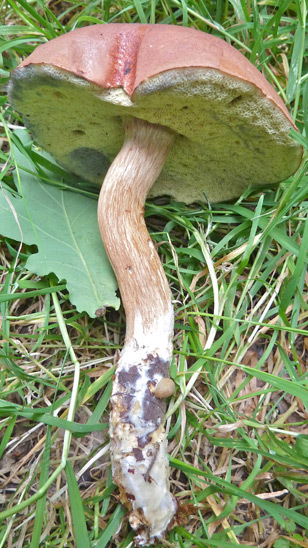 Another distinctive characteristic is that the large floppy ring on the stem has grooved (striate) markings on the top side. 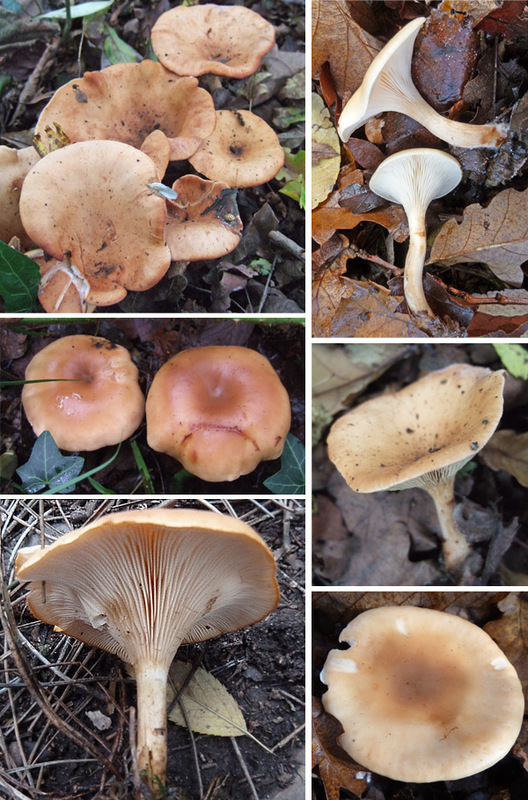 Armed with this information you can be sure of not confusing the Blusher with the very poisonous Panther Cap (Amanita pantherina). To mention key points, the Panther Cap has ‘pure’ white scales on it’s cap and does not have striate markings on the ring at all. 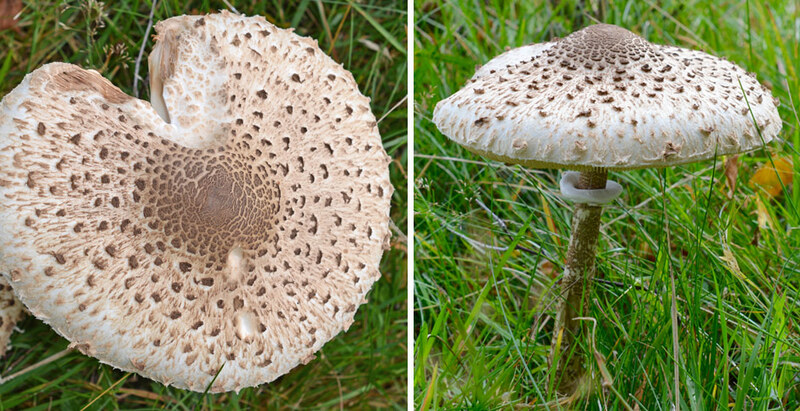 Another similar looking mushroom is the Grey Spotted Amanita (Amanita excelsa) which also fruits in summer and autumn. 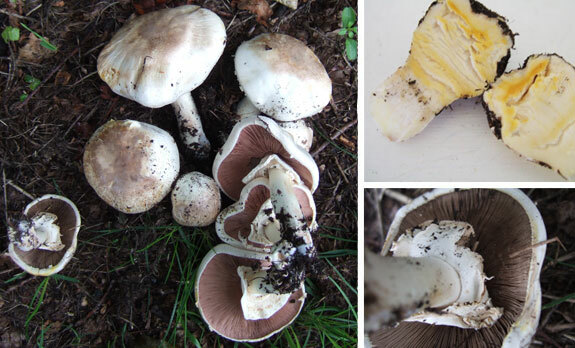 It has a brown (sometimes greyish) cap with dull whitish scales which eventually wash off to leave a smooth surface. It also has a grooved ring but does not ‘blush’ when handled or damaged. It is said to be edible, but I think it would be best to be avoided altogether. I haven’t cooked and eaten a Blusher, but I have read that they are very tasty indeed. Please feel free to leave a comment if you have experienced the taste (along with a good recipe if you have one)! Thanks. Notice the pinkish tinge on the cap and scales in this red/brown coloured Blusher. 5-15cm width. Pinkish or flesh coloured to reddish-brown. Off white/grey scales sometimes with reddish patches. 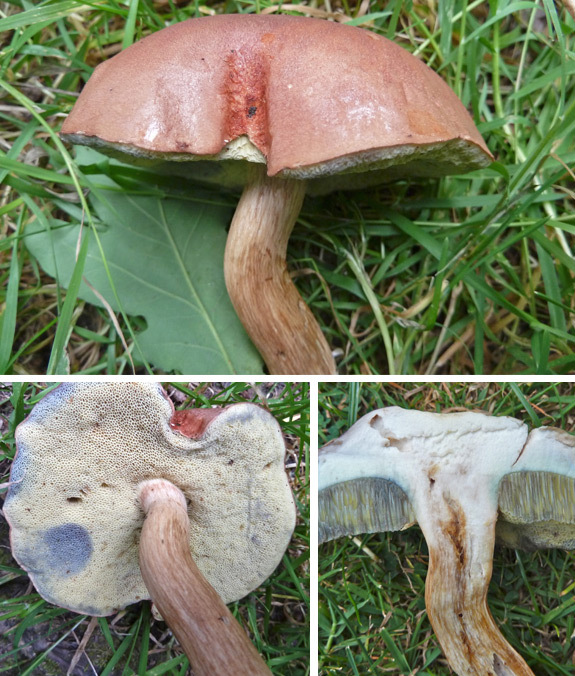 Nibbled areas are flushed with pinkish-red colour. 6-14cm x 1-2.5cm. White with pinkish/reddish tints. Bulbous base. Large ring, grooved (striated) on upper side. Free & white. Spotted red where damaged. In coniferous and deciduous woodland. Summer & autumn. Very common. Edible. Must be boiled before cooking. Discard water. Well, this UK drought we’re having this April has got to be the wettest on record! But the morels are enjoying it and they’re still out there. The pictures of the following were kindly submitted by Thalia Kenton when she was asking about them earlier this April – thanks again for the pics Thalia. As you know, what we have here is a Morel (Morille) (Morchella esculenta) but it’s looking a little off colour than it normally would! Strange stuff indeed. What we have to understand is that there are many variants of the delightful Morel out there to be discovered. Size, shape and colour can vary so much from Morel to Morel, but are typically light brown/ochre in colour. Caps can be round, oval or conical-like (but not so much as the Black Morel). One thing is for sure though is that this is a Morel and not the poisonous False Morel (Gyromitra esculenta) which is darker red/brown with twisted lobes in an irregular ‘brain-like’ shape. It is found mainly with conifers at the same time of year, particularly favouring sandy soil. I’ve had so many pictures lately from several website visitors and I’ve had at least 3 people finding similar looking Morels. It’s all good stuff. And they’re exceptionally make for good eating. Just cross-check you’ve find the right thing first before cooking.